Phantom Chaser Is A New Action-Packed Role Playing Game For Android, Now Available On Google Play Store. Follow The Phantom Hunters On An Epic Journey To Defeat The Evil Boss. Floppygames Today Finally Released The Phantom Chaser Game On Google Play Store. In This Game, You Explore The World Of Phantom Chaser, Collect 130+ Phantoms From Various Myths & Legends. There Is A Unique & Fun Mimic System Also – Posses Your Character With Phantoms To Absorb Its Abilities And Unleash Powerful Skills. 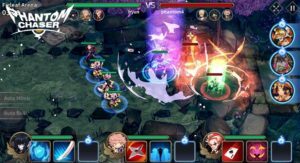 All The Characters Are Divided Into 3 Roles – Configure Your Team Wisley – Melee, Mid-Range, And Long-Range. You Acquire Phantoms By Playing Stages, Summoning And Crafting. To Unlock Potential Powers Of Phantoms – Level Up, Upgrade, And Evolve. After Downloading From Google Play Store, You Have To Download The Patch. Some Users Are Facing Issue While Downloading Patch Like Stuck On 21 MB, 100%, File Failed Etc. If You Are Facing These Issues, You Need To Wait For An Update Which May Fix These Bugs And Issues. Make Sure You Have Enough Free Space In Your Phone To Get Rid Of These Errors. However, It’s A Good Game With Great Graphics, Characters, And Gameplay Is Also Excellent. Price – Free[In-App Purchase], Size – 65 MB+Patch[Make Sure You Must Have Enough Space]. Download – Here[Google Play Store].